Last night marked the first time that I’ve ever taken a bite of the enticing, house concert pie. House concerts are, on the face of it, possibly the most humane and non-exploitive way to experience live music at a scale and intimacy most conducive to maximum enjoyment. After at least a decade when this potentially exciting trend was taking place, why was it that I had never chanced to attend such a show? Well, that primarily came down to the fact that the format, by nature, is skewed to the singer-songwriter end of the spectrum. As mentioned of late, that’s not the sort of thing I am drawn to very strongly. What caught my eye this time was seeing a mention in the local freekly, the Mountain Xpress, where the writer revealed that Germany’s Centrozoon would be playing at Streamside Studios on the 10th of November. The duo was comprised of touch guitarist Markus Reuter and synthesist Bernhard Wöstheinrich. Mr. Reuter was listed as a Fripp-taught Guitar Craft graduate who beyond that, is a member of both Tony Levin’s Stick Men and The Crimson ProjeCKt. Sold! I signed up for the event, and last night, I attended. Streamside Sound was a cozy estate set in the woods of Arden, near the Blue Ridge Parkway. I made my way to the site just in the nick of time and was ushered in to the performance space by helpful signage and the host, Sally Sparks, who greeted attendees as she received the artist’s suggested fee. As the fee was modest, especially for artists who came from Germany for this tour, I took the liberty of paying a bit more. Ms. Sparks is also a musician and the home where Centrozoon was playing was part of her studio/residential complex. She comes by her experimental electronics honestly with a background in guitars and synthesis. She endorses the Haken-audio Continuum Fingerboard, so at the very least, she has what must be perfect pitch in addition to a penchant for exotic synth interfaces. I chatted with a few of the other attendees, some of whom were fellow residents in the local community who partake of these shows on a more regular basis than myself, but that may change. 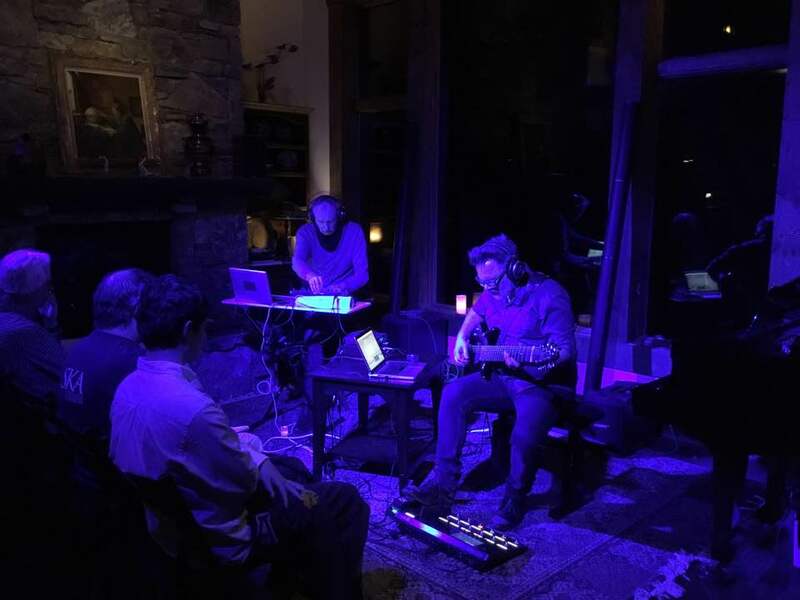 The setup in the large performance room with vaulted ceilings was fairly simple; two laptops and a selection of synth controllers, pedals and Reuter’s touch guitar. When the show commenced, Reuter explained that this tour was in celebration of the band’s 20th year, and as such, was a look back at their earlier sounds. The fact that the band was improvisational made me wonder exactly just how to parse this data. Then they began playing and I quickly surmised that the guitar playing that Reuter was proffering was more grounded and less abstract than what his current style might be. He was playing a touch guitar of his own design. I thought at first it might be a Warr guitar, but it had just eight frets in the distinctive touch fashion. I quickly noticed that the hand of his mentor could be discerned within the sometime fluid runs that meshed with the loops and modules of Mr. Wöstheinrich. The improvs were built in three long-ish sets with short, intermediate breaks where the audience and performers partook of chat and libations. Reuter would discuss their intents and methodologies to the extent that any musician could about what was an improv, and then the sounds began to flow. While the occasional Frippian licks enlivened the sets, Reuter was equally at home with a more abstract tone, as Wöstheinrich added both melodic and occasionally, rhythmic complexity to the set. The blue tinted lighting was a coherent fit with the music itself, which unfolded like viscous plumes of azure vapor. The evening was fast moving for what was basically three long periods of constantly evolving music. Reuter was controlling the master mix and his touch guitar on his laptop as Wöstheinrich was mixing his loops that he fed into Reuter’s system. All of the technology in evidence resulted in what was a very biological music. When the show ended, I took the time to engage another person in a bit of conversation before slipping out into the night, already past my bed time, but already in a pleasing alpha state due to the evening’s calm, yet engaging tonebed. Centrozoon are currently maneuvering through the Eastern Seaboard, here is the rest of their itinerary. This entry was posted in Concert Review and tagged 2017, Centrozoon, Live Concerts. Bookmark the permalink. “…plumes of azure vapor.” Magnificent Monk! The living room concert model does interest me. David J has been spending the past 4 or 5 months performing in this manner and a few of my friends on the left coast have enjoyed the evenings. Echorich – I discussed my lack of experience with the living room concert model, as you deftly put it, with our host. She agreed that it predisposes itself to acoustic guitar types, but thankfully, her passions allowed for something much more than that this evening. I actually recall she had David Torn there last year, and I had thought about attending but the cash wasn’t there. David Torn! I certainly would have seen that. I have seen him once solo in the late 90s and he was inspiring. I have also seen him with Mark Isham and Mick Karn and that was blissful!